Slave-taking aliens invade the solar system and attack Earth to teach humanity it cannot overthrow the millennia-old system of Buyers, Market worlds, and Collector ships. Former SEAL Bill MacCarthy and Air Force captain Jane Yamaguchi lead America and the world in a fight against six invading Collector ships. But even with the help of two American subs and two small transports, their ship Blue Sky is badly outgunned. Can they win this fight? Or will they and all humans end up as slaves sold at the nearby Market world? This tale gives retired Navy SEAL Bill MacCarthy his biggest surprise, bigger than being kidnapped by aliens! The Collector ship aliens he and Air Force captain Jane Yamaguchi defeated earlier now return to the solar system in a six-ship fleet armed to the teeth. Bill and Jane have just their single starship. The aliens plan to destroy Earth's space industry and capture hundreds of humans for sale to Buyers on distant stars. Bill and Jane discover that their first effort to subvert a galactic system of people Buyers, Market worlds, and Collector ships was not enough. Now they have to do more. That begins with getting the Joint Chiefs of Staff on their side as they figure out how to fight rampaging aliens. Their efforts eventually lead them to the nearest Market world where intelligent people are bought and sold into forced labor. A final confrontation with hundreds of Buyers puts the survival of humanity on the line! Would you try another book from T. Jackson King and/or Somerset Hamilton? I hope their's another book in this series it really left an opening for one. I didn't really have any major issues with the Narrator. I like his Diligent Taskmaster evil cockroach alien voice. Maybe he could have made Jane sound a little sexier some times. If you could play editor, what scene or scenes would you have cut from Fight the Aliens? Probably some of the Deep Six Saloon stuff but I know he was just introducing the new people. Yeah, it kind of reminds me of Serendipity which I really loved, everybody carrying sidearms and getting into it with the bad locals. Will definitely check out the next book in the series and some of T Jackson's other stuff. Earth is attacked by the slave taking aliens. 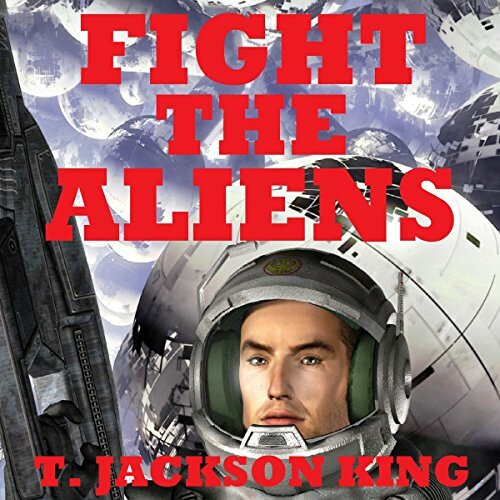 Where does Fight the Aliens rank among all the audiobooks you’ve listened to so far? Definitely a to 10%er. Interesting unusual story, memorable characters, and lots of good action. What was one of the most memorable moments of Fight the Aliens? When Jane has to convince the Joint Chiefs of Staff that she knows the best way to fight the 6 alien starships that have come to bomb earth back into the stone age with her 1 ship. What about Somerset Hamilton’s performance did you like? It was easy to tell who was talking and what they were feeling. He kept the action moving. The battle to save earth from slave taking aliens! I enjoyed it even more that the first book in the series "Escape from Aliens". Looking forward to the next book in the series.